I read about this book in last Sunday's edition of the San Francisco Chronicle. This is a different perspective from that presented in Borges' poem, or explored in Vidal's novel, Messiah. If I am right that human beings continue always to look for ways to deny their real place in the world (and specifically to accept that we live not only in a human-created world, but in the World of Nature, too, and that we are ultimately dependent upon that World of Nature), then there is no better example of this than our efforts to "defeat death." Or to postpone it through "radical life extension." 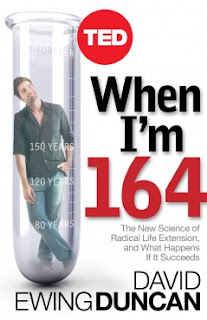 Duncan is not "pushing" the idea of radical life extension as a desired goal, and he notes, in fact, that an unscientific poll that he has been conducting on his "When I'm 164" website indicates that this is not something that most people seem to be hankering after, either. That said, it is clear from Duncan's book that massive amounts of money and energy are being directed into the pursuit of what amounts to perpetual life. In my opinion, it might be better to direct our energies and money into efforts to make "our" world better, both more humane and more consistent with the World of Nature, upon which we are ultimately dependent. Instead, and Duncan's book provides one clear example, we continue to defy the inevitabilities imposed by the World of Nature, in our ultimately self-defeating effort to deny the realities of who we are, and where we actually live.